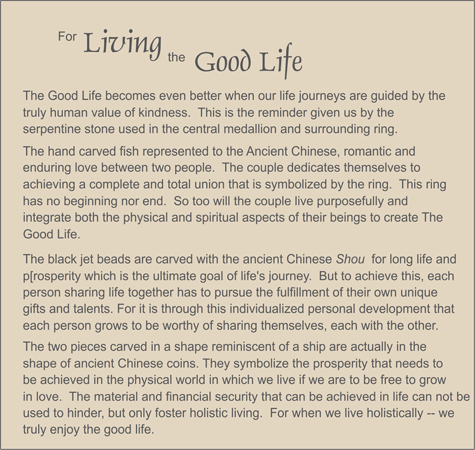 MEDALLION: Marbleized serpentine hand carved medallion depicting double fish which symbolized a loving couple to the ancient Chinese, beaded into a marbleized serpentine ring. ACCENTS: Black jet carved in the shape of the ancient Chinese Shou, serpentine carved in the shape of an ancient Chinese coin (boat-like) and black agate. COMMENTS: Marbleized serpentine is no longer available to the artisans who carve these medallions. Only a few remain for purchase.